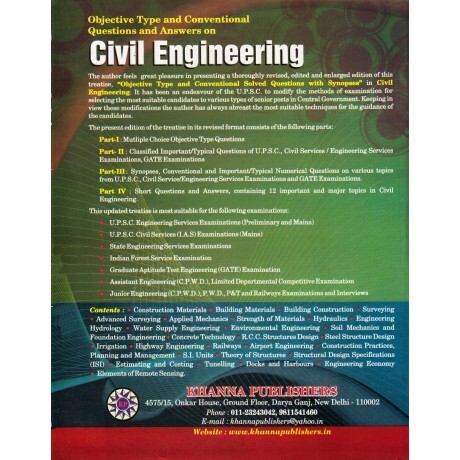 Preface The author feels great pleasure in presenting a thoroughly revised, edited and enlarged edition of this treatise, "Objective type and conventional solved questions with synopses" in civil engineering. It has been an endeavour of the U.P.S.C. to modifythe methods of examination for selecting the most suitable candidate to various types of senior posts in Central Government. Keeping in view these modifications, the author has always abreast the most suitable techniques for the guidance of the candidates._x000D_ The 31st edition of this treatise has been gone through thoroughly and mistake/omissions have been corrected where-ever needed. The main changes that have been made in this edition are as under:<br />(i). Addition of new chapter, &lsquo;Construction Materials&rsquo; as the first chapter that include the latest types of questions being asked and also added some questions of relevant matter in every chapter._x000D_ (ii). A new chapter on Engineering Hydrology has been added as per suggestions received from learned candidates._x000D_ (iii). The lasted questions of UPSC Engineering Services/GATE have been added for the guidance of the candidates._x000D_ (iv). Answers of each chapter have been given at the end of each chapter._x000D_ The thoroughly revised edition of latest questions will prove this treatise more useful for all types of examinations in Civil Engineering.The author feels great pleasure in presenting a thoroughly revised, edited and enlarged edition of this treatise, "Objective type and conventional solved questions with synopses" in civil engineering. It has been an endeavour of the U.P.S.C. to modifythe methods of examination for selecting the most suitable candidate to various types of senior posts in Central Government. Keeping in view these modifications, the author has always abreast the most suitable techniques for the guidance of the candidates._x000D_ The 31st edition of this treatise has been gone through thoroughly and mistake/omissions have been corrected where-ever needed. The main changes that have been made in this edition are as under:<br />(i). Addition of new chapter, &lsquo;Construction Materials&rsquo; as the first chapter that include the latest types of questions being asked and also added some questions of relevant matter in every chapter._x000D_ (ii). A new chapter on Engineering Hydrology has been added as per suggestions received from learned candidates._x000D_ (iii). The lasted questions of UPSC Engineering Services/GATE have been added for the guidance of the candidates._x000D_ (iv). Answers of each chapter have been given at the end of each chapter._x000D_ The thoroughly revised edition of latest questions will prove this treatise more useful for all types of examinations in Civil Engineering.The author feels great pleasure in presenting a thoroughly revised, edited and enlarged edition of this treatise, "Objective type and conventional solved questions with synopses" in civil engineering. It has been an endeavour of the U.P.S.C. to modifythe methods of examination for selecting the most suitable candidate to various types of senior posts in Central Government. Keeping in view these modifications, the author has always abreast the most suitable techniques for the guidance of the candidates._x000D_ The 31st edition of this treatise has been gone through thoroughly and mistake/omissions have been corrected where-ever needed. The main changes that have been made in this edition are as under:<br />(i). Addition of new chapter, &lsquo;Construction Materials&rsquo; as the first chapter that include the latest types of questions being asked and also added some questions of relevant matter in every chapter._x000D_ (ii). A new chapter on Engineering Hydrology has been added as per suggestions received from learned candidates._x000D_ (iii). The lasted questions of UPSC Engineering Services/GATE have been added for the guidance of the candidates._x000D_ (iv). 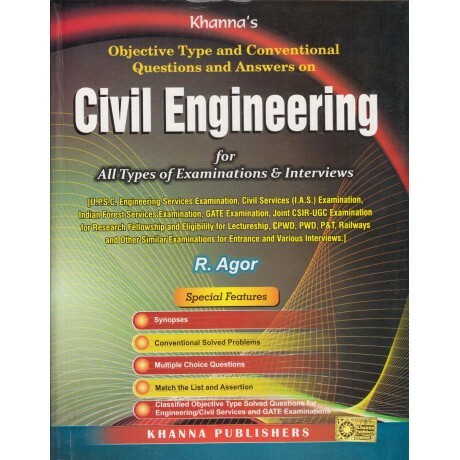 Answers of each chapter have been given at the end of each chapter._x000D_ The thoroughly revised edition of latest questions will prove this treatise more useful for all types of examinations in Civil Engineering.The author feels great pleasure in presenting a thoroughly revised, edited and enlarged edition of this treatise, "Objective type and conventional solved questions with synopses" in civil engineering. It has been an endeavour of the U.P.S.C. to modifythe methods of examination for selecting the most suitable candidate to various types of senior posts in Central Government. Keeping in view these modifications, the author has always abreast the most suitable techniques for the guidance of the candidates._x000D_ The 31st edition of this treatise has been gone through thoroughly and mistake/omissions have been corrected where-ever needed. The main changes that have been made in this edition are as under:<br />(i). Addition of new chapter, &lsquo;Construction Materials&rsquo; as the first chapter that include the latest types of questions being asked and also added some questions of relevant matter in every chapter._x000D_ (ii). A new chapter on Engineering Hydrology has been added as per suggestions received from learned candidates._x000D_ (iii). The lasted questions of UPSC Engineering Services/GATE have been added for the guidance of the candidates._x000D_ (iv). Answers of each chapter have been given at the end of each chapter._x000D_ The thoroughly revised edition of latest questions will prove this treatise more useful for all types of examinations in Civil Engineering.The author feels great pleasure in presenting a thoroughly revised, edited and enlarged edition of this treatise, "Objective type and conventional solved questions with synopses" in civil engineering. It has been an endeavour of the U.P.S.C. to modifythe methods of examination for selecting the most suitable candidate to various types of senior posts in Central Government. Keeping in view these modifications, the author has always abreast the most suitable techniques for the guidance of the candidates._x000D_ The 31st edition of this treatise has been gone through thoroughly and mistake/omissions have been corrected where-ever needed. The main changes that have been made in this edition are as under:<br />(i). Addition of new chapter, &lsquo;Construction Materials&rsquo; as the first chapter that include the latest types of questions being asked and also added some questions of relevant matter in every chapter._x000D_ (ii). A new chapter on Engineering Hydrology has been added as per suggestions received from learned candidates._x000D_ (iii). The lasted questions of UPSC Engineering Services/GATE have been added for the guidance of the candidates._x000D_ (iv). Answers of each chapter have been given at the end of each chapter._x000D_ The thoroughly revised edition of latest questions will prove this treatise more useful for all types of examinations in Civil Engineering.The author feels great pleasure in presenting a thoroughly revised, edited and enlarged edition of this treatise, "Objective type and conventional solved questions with synopses" in civil engineering. It has been an endeavour of the U.P.S.C. to modifythe methods of examination for selecting the most suitable candidate to various types of senior posts in Central Government. Keeping in view these modifications, the author has always abreast the most suitable techniques for the guidance of the candidates._x000D_ The 31st edition of this treatise has been gone through thoroughly and mistake/omissions have been corrected where-ever needed. The main changes that have been made in this edition are as under:<br />(i). Addition of new chapter, &lsquo;Construction Materials&rsquo; as the first chapter that include the latest types of questions being asked and also added some questions of relevant matter in every chapter._x000D_ (ii). A new chapter on Engineering Hydrology has been added as per suggestions received from learned candidates._x000D_ (iii). The lasted questions of UPSC Engineering Services/GATE have been added for the guidance of the candidates._x000D_ (iv). Answers of each chapter have been given at the end of each chapter._x000D_ The thoroughly revised edition of latest questions will prove this treatise more useful for all types of examinations in Civil Engineering.The author feels great pleasure in presenting a thoroughly revised, edited and enlarged edition of this treatise, "Objective type and conventional solved questions with synopses" in civil engineering. It has been an endeavour of the U.P.S.C. to modifythe methods of examination for selecting the most suitable candidate to various types of senior posts in Central Government. Keeping in view these modifications, the author has always abreast the most suitable techniques for the guidance of the candidates._x000D_ The 31st edition of this treatise has been gone through thoroughly and mistake/omissions have been corrected where-ever needed. The main changes that have been made in this edition are as under:<br />(i). Addition of new chapter, &lsquo;Construction Materials&rsquo; as the first chapter that include the latest types of questions being asked and also added some questions of relevant matter in every chapter._x000D_ (ii). A new chapter on Engineering Hydrology has been added as per suggestions received from learned candidates._x000D_ (iii). The lasted questions of UPSC Engineering Services/GATE have been added for the guidance of the candidates._x000D_ (iv). Answers of each chapter have been given at the end of each chapter._x000D_ The thoroughly revised edition of latest questions will prove this treatise more useful for all types of examinations in Civil Engineering.The author feels great pleasure in presenting a thoroughly revised, edited and enlarged edition of this treatise, "Objective type and conventional solved questions with synopses" in civil engineering. It has been an endeavour of the U.P.S.C. to modifythe methods of examination for selecting the most suitable candidate to various types of senior posts in Central Government. Keeping in view these modifications, the author has always abreast the most suitable techniques for the guidance of the candidates._x000D_ The 31st edition of this treatise has been gone through thoroughly and mistake/omissions have been corrected where-ever needed. The main changes that have been made in this edition are as under:<br />(i). Addition of new chapter, &lsquo;Construction Materials&rsquo; as the first chapter that include the latest types of questions being asked and also added some questions of relevant matter in every chapter._x000D_ (ii). A new chapter on Engineering Hydrology has been added as per suggestions received from learned candidates._x000D_ (iii). The lasted questions of UPSC Engineering Services/GATE have been added for the guidance of the candidates._x000D_ (iv). Answers of each chapter have been given at the end of each chapter._x000D_ The thoroughly revised edition of latest questions will prove this treatise more useful for all types of examinations in Civil Engineering.The author feels great pleasure in presenting a thoroughly revised, edited and enlarged edition of this treatise, "Objective type and conventional solved questions with synopses" in civil engineering. It has been an endeavour of the U.P.S.C. to modifythe methods of examination for selecting the most suitable candidate to various types of senior posts in Central Government. Keeping in view these modifications, the author has always abreast the most suitable techniques for the guidance of the candidates._x000D_ The 31st edition of this treatise has been gone through thoroughly and mistake/omissions have been corrected where-ever needed. The main changes that have been made in this edition are as under:<br />(i). Addition of new chapter, &lsquo;Construction Materials&rsquo; as the first chapter that include the latest types of questions being asked and also added some questions of relevant matter in every chapter._x000D_ (ii). A new chapter on Engineering Hydrology has been added as per suggestions received from learned candidates._x000D_ (iii). The lasted questions of UPSC Engineering Services/GATE have been added for the guidance of the candidates._x000D_ (iv). Answers of each chapter have been given at the end of each chapter._x000D_ The thoroughly revised edition of latest questions will prove this treatise more useful for all types of examinations in Civil Engineering.The author feels great pleasure in presenting a thoroughly revised, edited and enlarged edition of this treatise, "Objective type and conventional solved questions with synopses" in civil engineering. It has been an endeavour of the U.P.S.C. to modifythe methods of examination for selecting the most suitable candidate to various types of senior posts in Central Government. Keeping in view these modifications, the author has always abreast the most suitable techniques for the guidance of the candidates._x000D_ The 31st edition of this treatise has been gone through thoroughly and mistake/omissions have been corrected where-ever needed. The main changes that have been made in this edition are as under:<br />(i). Addition of new chapter, &lsquo;Construction Materials&rsquo; as the first chapter that include the latest types of questions being asked and also added some questions of relevant matter in every chapter._x000D_ (ii). A new chapter on Engineering Hydrology has been added as per suggestions received from learned candidates._x000D_ (iii). The lasted questions of UPSC Engineering Services/GATE have been added for the guidance of the candidates._x000D_ (iv). Answers of each chapter have been given at the end of each chapter._x000D_ The thoroughly revised edition of latest questions will prove this treatise more useful for all types of examinations in Civil Engineering.The author feels great pleasure in presenting a thoroughly revised, edited and enlarged edition of this treatise, "Objective type and conventional solved questions with synopses" in civil engineering. It has been an endeavour of the U.P.S.C. to modifythe methods of examination for selecting the most suitable candidate to various types of senior posts in Central Government. Keeping in view these modifications, the author has always abreast the most suitable techniques for the guidance of the candidates._x000D_ The 31st edition of this treatise has been gone through thoroughly and mistake/omissions have been corrected where-ever needed. The main changes that have been made in this edition are as under:<br />(i). Addition of new chapter, &lsquo;Construction Materials&rsquo; as the first chapter that include the latest types of questions being asked and also added some questions of relevant matter in every chapter._x000D_ (ii). A new chapter on Engineering Hydrology has been added as per suggestions received from learned candidates._x000D_ (iii). The lasted questions of UPSC Engineering Services/GATE have been added for the guidance of the candidates._x000D_ (iv). Answers of each chapter have been given at the end of each chapter._x000D_ The thoroughly revised edition of latest questions will prove this treatise more useful for all types of examinations in Civil Engineering.The author feels great pleasure in presenting a thoroughly revised, edited and enlarged edition of this treatise, "Objective type and conventional solved questions with synopses" in civil engineering. It has been an endeavour of the U.P.S.C. to modifythe methods of examination for selecting the most suitable candidate to various types of senior posts in Central Government. Keeping in view these modifications, the author has always abreast the most suitable techniques for the guidance of the candidates._x000D_ The 31st edition of this treatise has been gone through thoroughly and mistake/omissions have been corrected where-ever needed. The main changes that have been made in this edition are as under:<br />(i). Addition of new chapter, &lsquo;Construction Materials&rsquo; as the first chapter that include the latest types of questions being asked and also added some questions of relevant matter in every chapter._x000D_ (ii). A new chapter on Engineering Hydrology has been added as per suggestions received from learned candidates._x000D_ (iii). The lasted questions of UPSC Engineering Services/GATE have been added for the guidance of the candidates._x000D_ (iv). Answers of each chapter have been given at the end of each chapter._x000D_ The thoroughly revised edition of latest questions will prove this treatise more useful for all types of examinations in Civil Engineering.The author feels great pleasure in presenting a thoroughly revised, edited and enlarged edition of this treatise, "Objective type and conventional solved questions with synopses" in civil engineering. It has been an endeavour of the U.P.S.C. to modifythe methods of examination for selecting the most suitable candidate to various types of senior posts in Central Government. Keeping in view these modifications, the author has always abreast the most suitable techniques for the guidance of the candidates._x000D_ The 31st edition of this treatise has been gone through thoroughly and mistake/omissions have been corrected where-ever needed. The main changes that have been made in this edition are as under:<br />(i). Addition of new chapter, &lsquo;Construction Materials&rsquo; as the first chapter that include the latest types of questions being asked and also added some questions of relevant matter in every chapter._x000D_ (ii). A new chapter on Engineering Hydrology has been added as per suggestions received from learned candidates._x000D_ (iii). The lasted questions of UPSC Engineering Services/GATE have been added for the guidance of the candidates._x000D_ (iv). Answers of each chapter have been given at the end of each chapter._x000D_ The thoroughly revised edition of latest questions will prove this treatise more useful for all types of examinations in Civil Engineering.The author feels great pleasure in presenting a thoroughly revised, edited and enlarged edition of this treatise, "Objective type and conventional solved questions with synopses" in civil engineering. It has been an endeavour of the U.P.S.C. to modifythe methods of examination for selecting the most suitable candidate to various types of senior posts in Central Government. Keeping in view these modifications, the author has always abreast the most suitable techniques for the guidance of the candidates._x000D_ The 31st edition of this treatise has been gone through thoroughly and mistake/omissions have been corrected where-ever needed. The main changes that have been made in this edition are as under:<br />(i). Addition of new chapter, &lsquo;Construction Materials&rsquo; as the first chapter that include the latest types of questions being asked and also added some questions of relevant matter in every chapter._x000D_ (ii). A new chapter on Engineering Hydrology has been added as per suggestions received from learned candidates._x000D_ (iii). The lasted questions of UPSC Engineering Services/GATE have been added for the guidance of the candidates._x000D_ (iv). Answers of each chapter have been given at the end of each chapter._x000D_ The thoroughly revised edition of latest questions will prove this treatise more useful for all types of examinations in Civil Engineering.The author feels great pleasure in presenting a thoroughly revised, edited and enlarged edition of this treatise, "Objective type and conventional solved questions with synopses" in civil engineering. It has been an endeavour of the U.P.S.C. to modifythe methods of examination for selecting the most suitable candidate to various types of senior posts in Central Government. Keeping in view these modifications, the author has always abreast the most suitable techniques for the guidance of the candidates._x000D_ The 31st edition of this treatise has been gone through thoroughly and mistake/omissions have been corrected where-ever needed. The main changes that have been made in this edition are as under:<br />(i). Addition of new chapter, &lsquo;Construction Materials&rsquo; as the first chapter that include the latest types of questions being asked and also added some questions of relevant matter in every chapter._x000D_ (ii). A new chapter on Engineering Hydrology has been added as per suggestions received from learned candidates._x000D_ (iii). The lasted questions of UPSC Engineering Services/GATE have been added for the guidance of the candidates._x000D_ (iv). Answers of each chapter have been given at the end of each chapter._x000D_ The thoroughly revised edition of latest questions will prove this treatise more useful for all types of examinations in Civil Engineering.The author feels great pleasure in presenting a thoroughly revised, edited and enlarged edition of this treatise, "Objective type and conventional solved questions with synopses" in civil engineering. It has been an endeavour of the U.P.S.C. to modifythe methods of examination for selecting the most suitable candidate to various types of senior posts in Central Government. Keeping in view these modifications, the author has always abreast the most suitable techniques for the guidance of the candidates._x000D_ The 31st edition of this treatise has been gone through thoroughly and mistake/omissions have been corrected where-ever needed. The main changes that have been made in this edition are as under:<br />(i). Addition of new chapter, &lsquo;Construction Materials&rsquo; as the first chapter that include the latest types of questions being asked and also added some questions of relevant matter in every chapter._x000D_ (ii). A new chapter on Engineering Hydrology has been added as per suggestions received from learned candidates._x000D_ (iii). The lasted questions of UPSC Engineering Services/GATE have been added for the guidance of the candidates._x000D_ (iv). Answers of each chapter have been given at the end of each chapter._x000D_ The thoroughly revised edition of latest questions will prove this treatise more useful for all types of examinations in Civil Engineering.The author feels great pleasure in presenting a thoroughly revised, edited and enlarged edition of this treatise, "Objective type and conventional solved questions with synopses" in civil engineering. It has been an endeavour of the U.P.S.C. to modifythe methods of examination for selecting the most suitable candidate to various types of senior posts in Central Government. Keeping in view these modifications, the author has always abreast the most suitable techniques for the guidance of the candidates._x000D_ The 31st edition of this treatise has been gone through thoroughly and mistake/omissions have been corrected where-ever needed. The main changes that have been made in this edition are as under:<br />(i). Addition of new chapter, &lsquo;Construction Materials&rsquo; as the first chapter that include the latest types of questions being asked and also added some questions of relevant matter in every chapter._x000D_ (ii). A new chapter on Engineering Hydrology has been added as per suggestions received from learned candidates._x000D_ (iii). The lasted questions of UPSC Engineering Services/GATE have been added for the guidance of the candidates._x000D_ (iv). Answers of each chapter have been given at the end of each chapter._x000D_ The thoroughly revised edition of latest questions will prove this treatise more useful for all types of examinations in Civil Engineering.The author feels great pleasure in presenting a thoroughly revised, edited and enlarged edition of this treatise, "Objective type and conventional solved questions with synopses" in civil engineering. It has been an endeavour of the U.P.S.C. to modifythe methods of examination for selecting the most suitable candidate to various types of senior posts in Central Government. Keeping in view these modifications, the author has always abreast the most suitable techniques for the guidance of the candidates._x000D_ The 31st edition of this treatise has been gone through thoroughly and mistake/omissions have been corrected where-ever needed. The main changes that have been made in this edition are as under:<br />(i). Addition of new chapter, &lsquo;Construction Materials&rsquo; as the first chapter that include the latest types of questions being asked and also added some questions of relevant matter in every chapter._x000D_ (ii). A new chapter on Engineering Hydrology has been added as per suggestions received from learned candidates._x000D_ (iii). The lasted questions of UPSC Engineering Services/GATE have been added for the guidance of the candidates._x000D_ (iv). Answers of each chapter have been given at the end of each chapter._x000D_ The thoroughly revised edition of latest questions will prove this treatise more useful for all types of examinations in Civil Engineering.The author feels great pleasure in presenting a thoroughly revised, edited and enlarged edition of this treatise, "Objective type and conventional solved questions with synopses" in civil engineering. It has been an endeavour of the U.P.S.C. to modifythe methods of examination for selecting the most suitable candidate to various types of senior posts in Central Government. Keeping in view these modifications, the author has always abreast the most suitable techniques for the guidance of the candidates._x000D_ The 31st edition of this treatise has been gone through thoroughly and mistake/omissions have been corrected where-ever needed. The main changes that have been made in this edition are as under:<br />(i). Addition of new chapter, &lsquo;Construction Materials&rsquo; as the first chapter that include the latest types of questions being asked and also added some questions of relevant matter in every chapter._x000D_ (ii). A new chapter on Engineering Hydrology has been added as per suggestions received from learned candidates._x000D_ (iii). The lasted questions of UPSC Engineering Services/GATE have been added for the guidance of the candidates._x000D_ (iv). Answers of each chapter have been given at the end of each chapter._x000D_ The thoroughly revised edition of latest questions will prove this treatise more useful for all types of examinations in Civil Engineering.The author feels great pleasure in presenting a thoroughly revised, edited and enlarged edition of this treatise, "Objective type and conventional solved questions with synopses" in civil engineering. It has been an endeavour of the U.P.S.C. to modifythe methods of examination for selecting the most suitable candidate to various types of senior posts in Central Government. Keeping in view these modifications, the author has always abreast the most suitable techniques for the guidance of the candidates._x000D_ The 31st edition of this treatise has been gone through thoroughly and mistake/omissions have been corrected where-ever needed. The main changes that have been made in this edition are as under:<br />(i). Addition of new chapter, &lsquo;Construction Materials&rsquo; as the first chapter that include the latest types of questions being asked and also added some questions of relevant matter in every chapter._x000D_ (ii). A new chapter on Engineering Hydrology has been added as per suggestions received from learned candidates._x000D_ (iii). The lasted questions of UPSC Engineering Services/GATE have been added for the guidance of the candidates._x000D_ (iv). Answers of each chapter have been given at the end of each chapter._x000D_ The thoroughly revised edition of latest questions will prove this treatise more useful for all types of examinations in Civil Engineering.The author feels great pleasure in presenting a thoroughly revised, edited and enlarged edition of this treatise, "Objective type and conventional solved questions with synopses" in civil engineering. It has been an endeavour of the U.P.S.C. to modifythe methods of examination for selecting the most suitable candidate to various types of senior posts in Central Government. Keeping in view these modifications, the author has always abreast the most suitable techniques for the guidance of the candidates._x000D_ The 31st edition of this treatise has been gone through thoroughly and mistake/omissions have been corrected where-ever needed. The main changes that have been made in this edition are as under:<br />(i). Addition of new chapter, &lsquo;Construction Materials&rsquo; as the first chapter that include the latest types of questions being asked and also added some questions of relevant matter in every chapter._x000D_ (ii). A new chapter on Engineering Hydrology has been added as per suggestions received from learned candidates._x000D_ (iii). The lasted questions of UPSC Engineering Services/GATE have been added for the guidance of the candidates._x000D_ (iv). Answers of each chapter have been given at the end of each chapter._x000D_ The thoroughly revised edition of latest questions will prove this treatise more useful for all types of examinations in Civil Engineering.The author feels great pleasure in presenting a thoroughly revised, edited and enlarged edition of this treatise, "Objective type and conventional solved questions with synopses" in civil engineering. It has been an endeavour of the U.P.S.C. to modifythe methods of examination for selecting the most suitable candidate to various types of senior posts in Central Government. Keeping in view these modifications, the author has always abreast the most suitable techniques for the guidance of the candidates._x000D_ The 31st edition of this treatise has been gone through thoroughly and mistake/omissions have been corrected where-ever needed. The main changes that have been made in this edition are as under:<br />(i). Addition of new chapter, &lsquo;Construction Materials&rsquo; as the first chapter that include the latest types of questions being asked and also added some questions of relevant matter in every chapter._x000D_ (ii). A new chapter on Engineering Hydrology has been added as per suggestions received from learned candidates._x000D_ (iii). The lasted questions of UPSC Engineering Services/GATE have been added for the guidance of the candidates._x000D_ (iv). Answers of each chapter have been given at the end of each chapter._x000D_ The thoroughly revised edition of latest questions will prove this treatise more useful for all types of examinations in Civil Engineering. Contents1. Algebra2. Trigonometry3. Coordinate Geometry4. Geometry5. Height and Distance6. MensurationEach and every one of us is trying to chase our dreams and be successful in the world. And as we.. Environment refers to the physical & social conditions in which people live whereas Ecology is defined as the study of interactions among organisms & their environment. The study of ever chang.. The Combined Defence Services (CDS) examination is conducted twice in the month of February and September by the Union Public Service Commission (UPSC) for recruiting officers into various Technical a..
About the BookAs long as mankind is living on this planet, science will live and as long as human needs are present, technology will advance. Twenty first century will see a tremendous advancement in ..
MacBook Series comprehensively covers the syllabus of General Studies’ portion of the UPSC and State PSC Preliminary Examination in concise and notes format. With unique advantage of both magazines an.. Author InfoAn editorial team of highly skilled professionals at Arihant, works hand in glove to ensure that the students receive the best and accurate content through our books. From inception till th.. The Management Aptitude Test (MAT) is conducted by the All India Management Association (AIMA) to facilitate Business Schools (B-Schools) to screen candidates for admission to MBA and allied programme..
Data Interpretation & Data Sufficiency which is an equally weighed section in many competitive examinations tests the thinking power and mind applicability skills of the candidates. The questions .. The Services Selection Board (SSB) conducts interviews for recruitment to varied posts and this book has been designed for the aspirants preparing for interviews conducted by the Services Selection Bo.. Liberalization of the banking sector has created many great job opportunities in different departments for various posts. IBPS conducts Specialist Officer Main Exam for IT Officers as part of Common R..
About the BookTechnical Trades these days has plenty of opportunities for the skilled individuals. For all such recruitments, the Railway Recruitment Boards conducts Technical Trades exams across the ..
About the Book Bachelor of Laws or LLB is a professional Under-graduate degree in law that enables one to become lawyer. Students seeking admission in this programme must clear ..
About the BookThe Common Law Admission Test (CLAT) is conducted by National Law Universities (NLU) as an entrance to their Under Graduate degree programmes in legal studies. Present guide, Compl..
About the Book Common Admission Test (CAT) is considered to be the most significant of all MBA Entrance Exams giving admission to management programmes at more than 5000 seats i..
About the Book To the soldier, battle is merely another word for skill, and courage is synonymous to honor. Conducted by UPSC, Combined Defense Services (CDS) Exam is the first te..